2. Fry the cumin seeds, onions and green chillies till onions turn golden. 3. Add the tomatoes and saute for 2 minutes. 4. Add garam masala powder, turmeric powder and salt. 5. Break the eggs into the pan and stir well. 6. Add coriander leaves and ketchup. 7. Mix well until eggs are set and well combined. 8. Gently warm the rotis or parathas on a hot tawa. 9. Spread 2 to 3 tblsp of the egg bhurji and roll tightly. 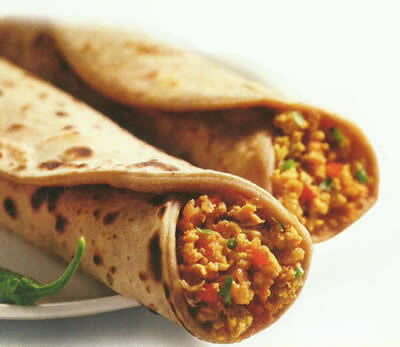 Feel free to comment or share your thoughts on this Egg Bhurji Roll Recipe from Awesome Cuisine.